Pro-poor tariff systems: what if ‘fair’ pricing isn’t fair enough? Let’s begin by supposing you work for a water utility company in a large city in West Africa (a city whose population is rapidly expanding). You’re tasked with fulfilling the utility’s mandate to provide clean and safe water for everyone in the city, ensuring that water remains affordable for all income groups but priced so as to discourage waste. If you can also work out how to pay for your system’s ongoing operation and maintenance costs, as well as the future expansion of the network into new neighbourhoods, all the better. It’s a tall order for any utility, let alone one that probably cannot access a great deal of funding from local or national governments. Appropriate water pricing strategies are essential to help utilities meet the demands listed above. Water tariffs (the charge paid by customers for water consumed) ensure the water that utilities provide is: 1) at least partly paid for; and 2) equitably priced, with poorer households paying less for water than consumers with higher incomes. 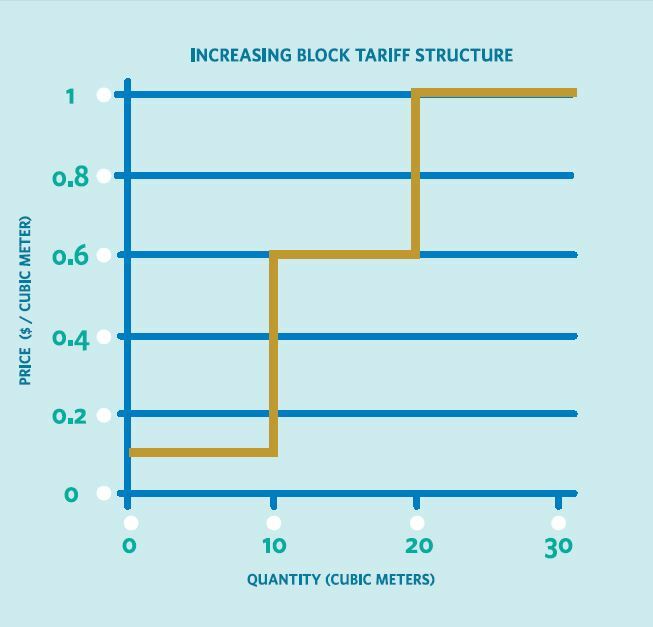 Example Increasing Block Tariff structure. Read more in WSUP’s Urban Programming Guide. Increasing Block Tariffs (IBTs) are the most prevalent type of tariff among the world’s utilities: they are fairly simple in terms of overall structure and seem to ensure that socio-economic status doesn’t define access to water, as consumers who use less water pay less per cubic metre of water. The first ‘block’ of water per cubic metre consumed (also known as a ‘lifeline’ block) is heavily subsidised. Once water consumption passes a certain threshold, the household will move into a higher price bracket, paying more per cubic metre. Three or four such blocks, each with an increase in charge aligned to increased water consumption, tend to be the norm. WSUP successfully advocated for the introduction of an IBT tariff system in Maputo, Mozambique, several years ago, in conjunction with a 50% reduction in the connection charge and recourse to staged payments; in our experience, IBTs can represent a significant improvement compared to what low-income communities had to pay previously. However, designing pro-poor tariff systems is rarely straightforward. IBTs promise cost recovery and water conservation without sacrificing equitable pricing, but their simplicity can mask unintended consequences. For one, the design of IBTs is based on the assumption that richer households use more water than poorer households. According to this logic, poorer households will naturally fall into the lower-priced blocks, and households that can afford to use piped water to wash their cars or flush their toilets will pay more. This effectively means that when utilities set their tariff rates, water consumption serves as a proxy for income. However, the link between water consumption and income has yet to be definitively proven. In low-income areas, a group of households may share the same metred water source, driving up the amount of water used and pushing the households into a more costly block. In some cases, IBTs have been designed in such a way that they actually have a regressive effect: if the lowest block is too generous in terms of water allowed to be consumed at a low price, higher-income groups will ‘leak’ into that price range and therefore benefit from subsidies alongside poorer households. The ‘share’ of subsidies, then, could be roughly the same for different socio-economic groups – hardly the point of what is meant to be a progressive pricing strategy that primarily benefits low-income consumers. An oversized lower tariff block is one of a number of points that utilities need to be wary of when designing IBTs. Some choose to include fixed charges or minimum consumption rates to recoup some costs and encourage responsible water use. However, these charges disproportionately impact poorer consumers. Fixed monthly charges will clearly take up more of a poorer household’s budget than that of a wealthier consumer. Minimum consumption rates will have a similar effect, but with the additional consequence of encouraging households that might have lower rates of consumption to use additional water that they’ve effectively been forced to pay for. This isn’t to say that IBTs are unfit for use; rather that utilities must always carefully examine what effect their pricing strategies will have. This will require collecting plenty of data and possibly introducing means-testing. In Colombia, geographic targeting is used to identify poorer houses and neighbourhoods for water and sewerage subsidisation, while more valuable properties pay ‘solidarity contributions’ to the utility rather than receiving any subsidies. In Chile, each household’s eligibility is assessed; utilities then apply the relevant discount and are reimbursed by the government. Interestingly, Mauritius’ unusual demography means that IBTs are a good way of ensuring a progressive result, as higher-income families tend to be larger and therefore use more water. Neither are IBTs the only viable pro-poor tariff system. Under Volume-Limited Free Water systems, the poorest households can consume a certain amount of water free of charge (removing the need for the ‘lifeline’ block and saving the utility from paying subsidies to better-off households). South Africa, for example, promises 6,000 litres of ‘Free Basic Water’ a month to each household, with some municipalities introducing electronic control valves that monitor the flow of water and prevent lower-income households from unwittingly using more water than they can afford. Households that can afford to do so can buy credit for their water meter if they go above the FBW allowance. What this blog hopefully goes some way to illustrate is that one size doesn’t fit all: utilities must carefully assess what kind of tariff structure or mode of pricing will work best for their customers, taking into account ability-to-pay, what water sources are used by how many people and the relationship between household size, poverty and water use.